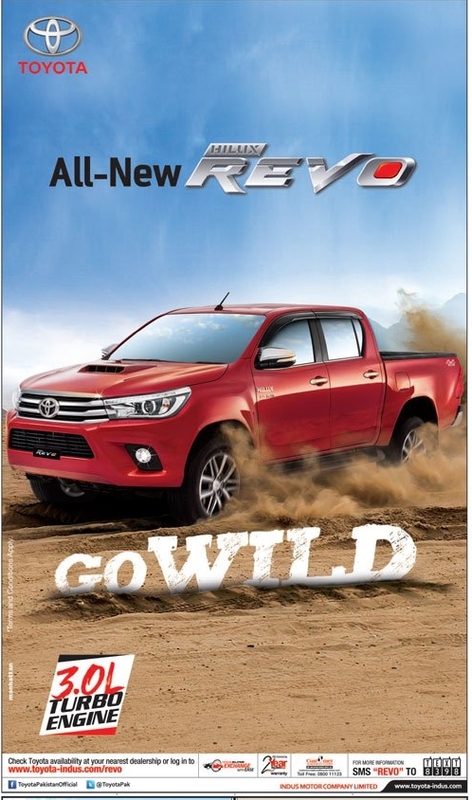 Toyota Indus introduced its 8th Generation all new Hilux Revo 2016 model is more powerful and toughest pickup truck which will take you on all extreme off road conditions like a beast. Now freely visit urban area with 8th Generation Revo 2016. 2016 all new Hilux Revo equipped with more powerful braking system with ABS and EDB + Brake Assist (BA) technologies which delivered more enhanced and superior braking system in all conditions. Toyota delivered new Anti Theft Safety system in Revo 2016 which restricted that only correct key is inserted otherwise engine will not start and also it generates alarm for unauthorized use. Other precautions measures are SRS & Knees Airbags, 2016 Revo comes with dual airbags for driver and passenger and also supports knees SRS airbags. Its interior design feels you that your are sitting in home Revo has Luxury Dashboard, 7 Inch IS Display with radio, iPod etc, Auto AC, Power Steering for smooth driving, Vibrant LED 4.2 inch color TFT Display which show every moments, digital clock, Luxury Cabin, 6-way power adjustment all at the nudge of a nob, Rear Armrest, Navigation system with with detailed 3D Maps with audio and visual prompts, Ultra Cooling for Beverages, Cooling cup holder, 12V Dc and 220V AC connectors, cruise control, Illuminated Central control buttons, Steering Switches with Telephone and voice recognition, Power Seats, Bag Holder, Sun glass holder, Coat Hook, Eco Lamp. All new Hilux Revo 2016 exterior is very beautiful like its interior design, Revo 2016 exterior contains Chiseled Perfection, LED Headlamp, DR Lamps, 18-inch Alloy Rims, Chrome Door Handles, Rear bumper Step, Sliding rear windows, Tailgate Stop Lamp, Jack Knife Key. More Details Are Available on Toyota-Indus official Site.